After this past Sunday’s ceremony ended, I promised everyone I was done with the Oscars for at least the next few months. But as they say in just about every action movie ever made: “just when I thought I was out, they pulled me back in.” What I have today is a great clip I was sent this morning of Steven Spielberg reacting to the Oscar nominations in 1976. In the previous year, “Jaws” took audiences by storm. 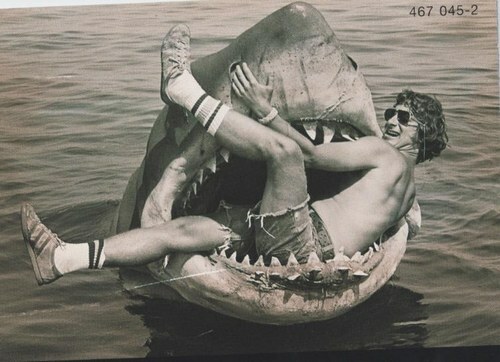 In this clip, Spielberg is none too pleased to find out that despite a Best Picture nomination for “Jaws”, the Academy failed to recognize his directing. Spielberg blames his snub on commercial backlash. That is a possibility, as most of the nominations in the past few years have been for lower grossing movies. But then again, no one is going to nominate “Transformers” or “Breaking Dawn” for Best Picture. I am guessing the real case is that Spielberg just missed the shortlist, given that the nominated directors were Milos Forman, Sidney Lumet, Stanley Kubrick, Robertrt Altman, and Federico Fellini. That’s a hard group to compete with. Anyway, this is a great video to give you some insight on what filmmakers think of the Oscars. It will also give you a hint of what the 1970s was like. Its an especially different Spielberg than we were used to, a man who was fighting the system before he ultimately became it. Credit to Ben Silverberg for sending me the video. This entry was posted in 1970s, Jaws, Oscars, Steven Spielberg on March 1, 2012 by ian0592.